During the early morning hours of October 2, 2017, the holy physical remains of His Holiness 33rd Menri Trizen Lungtok Tenpé Nyima Rinpoche will be cremated during an elaborate fire offering ritual at Menri Monastery in Dolanji, India. For the past five days, concluding at 3:30 a.m. prior to the beginning of the actual cremation ceremony, the monks have been performing the Kün Rik Le Zhi Gyü Nga, The Full Cycle of the Four Activities and the Five Tantras with cycles for each of the four kinds of enlightened activity which are classified as peaceful, expansive, powerful and wrathful. In preparation for the cremation, a special cremation chorten has been constructed near the gompa and the butter lamp house. This cremation chorten (Sanskrit: stupa), built under the guidance of Khedup Gyatso who is a treasure of knowledge in the Yungdrung Bön community and a relative of His Holiness 33rd Menri Trizen Rinpoche, will be where the holy remains will be taken for cremation. This chorten has been constructed exactly to the dimensions of the sand mandalas of the Kün Rik cycle that will be burned with the holy remains. After the cremation ash has been collected, this chorten will be torn down. The Kü Dung, or holy physical remains, will take up to three hours to burn. 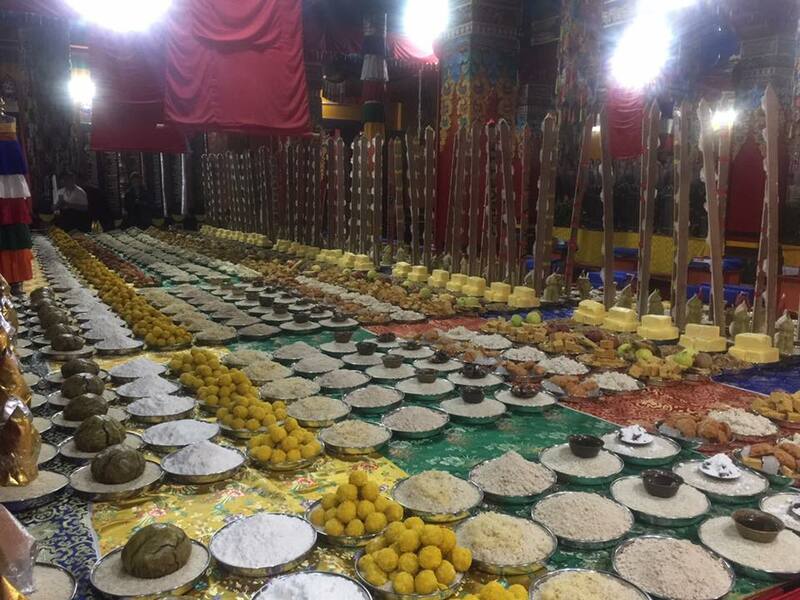 After that, it will take an additional day to offer and burn the vast array of offerings that are housed inside the gompa at Menri Monastery. Everything is made clean through prayer, and cleansing with pure water and incense. Among the many offerings are prayers of aspiration that have been written in pure gold and silver and placed upon tall wooden boards that will be read aloud and then offered to the sacred fire. 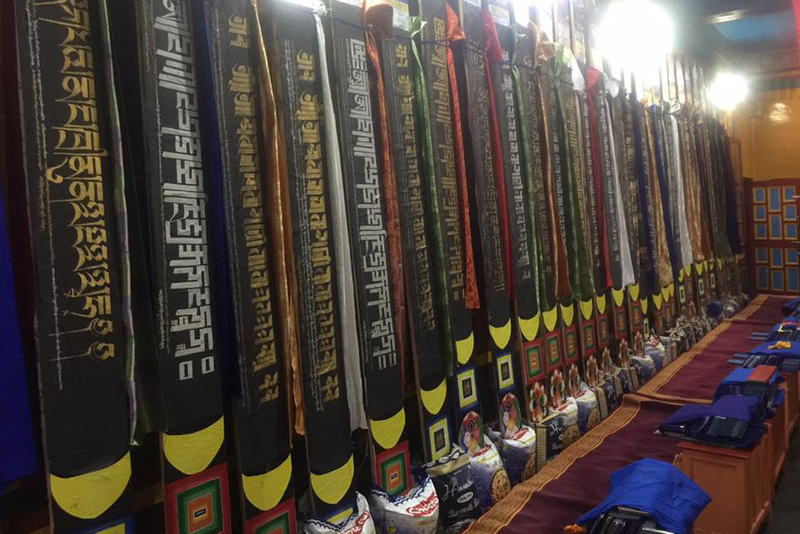 This vast array of offerings are not given as a support for His Holiness 33rd Menri Trizen Rinpoche. Rather, his sacred activity of having attained realization is taken as an auspicious opportunity to generate great benefit for all sentient beings. Prayers of aspiration written in precious gold and silver. During the time of the Fire Offering Ritual, lay people continuously circumambulate the sacred site. It will take many days for the cremation ashes to cool. At that time, the monks will collect the sacred ash and also look for kü dung ringsel. These kü dung ringsel, or relics of the holy physical remains, can appear in the cremation ash of realized beings and take many forms including the appearance of sacred images on small bone fragments or small, pearl-like spheres. 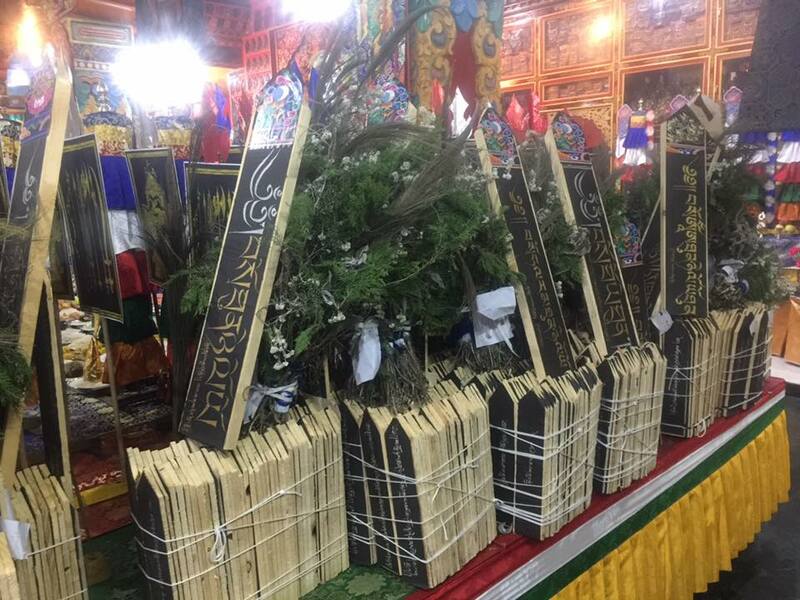 The cremation ash will be made into tsa tsa and placed within a special memorial chorten dedicated to His Holiness 33rd Menri Trizen Rinpoche. Posted on October 1, 2017, in Tibetan Culture & History, Tibetan Lamas, Uncategorized. Bookmark the permalink. 5 Comments. Very helpful and interesting. Thank you, Raven. This is so beautiful. Brings tears. Thank you. thanks for your intrctions & knowleadge.